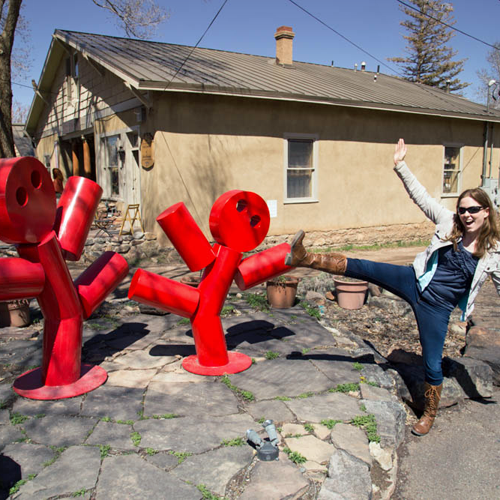 Our second week in Albuquerque was just as jam-packed as the first. 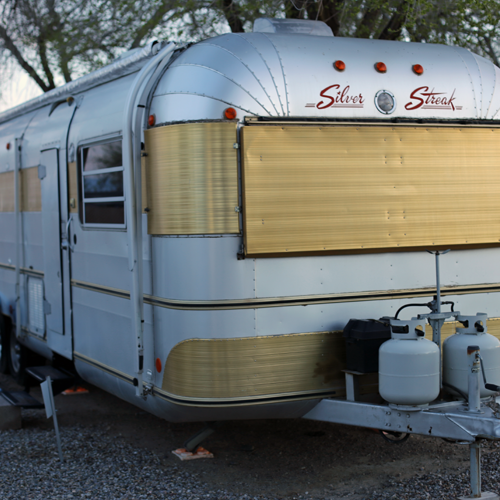 After a repair of our landing gear was finalized, we moved from High Desert RV Park to Enchanted Trails RV Park across I-40. The reason for our move was twofold. 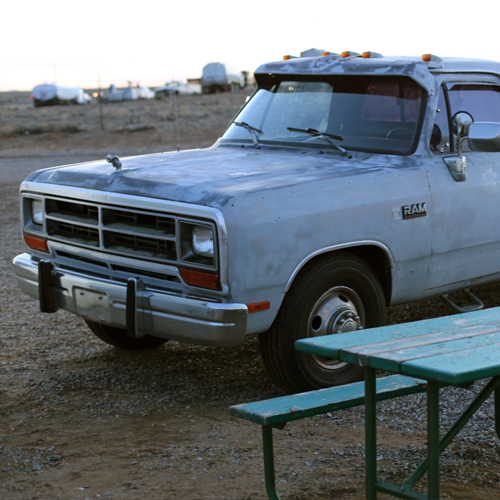 First, although High Desert was accommodating and clean, our site was unlevel. Second, Enchanted Trails had more personality, and we were ready for a change. 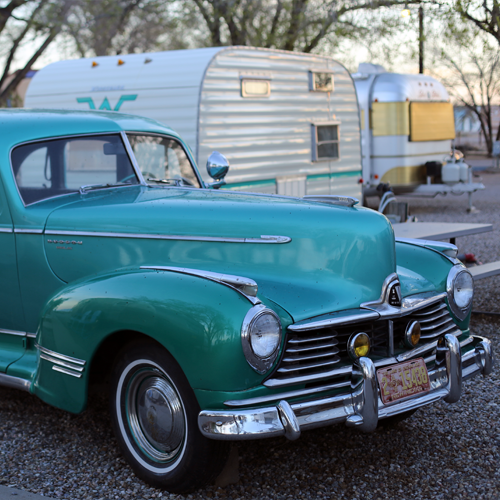 Interspersed with the RVs at Enchanted Trails are lots of vintage campers and vehicles. We loved checking them out on our daily walks. 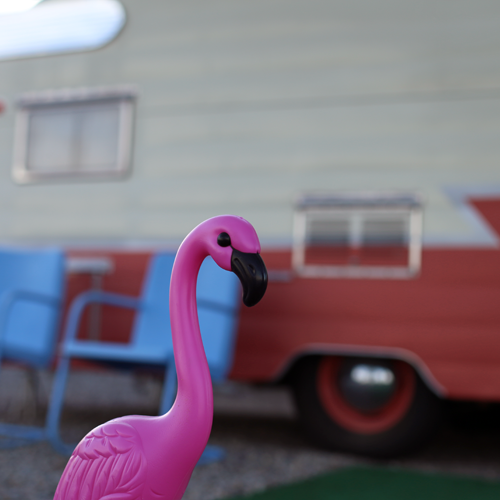 The park rents out the campers to overnight guests. Silver and gold and way-too-cool. We could totally live in this! They sure don't make 'em like the used to, huh? 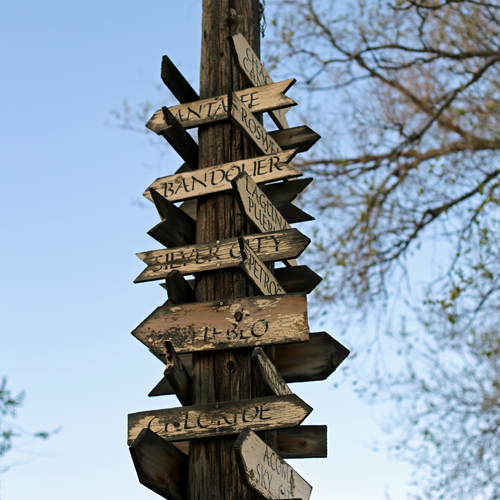 There were plenty of other pieces of vintage charm around the park, like this directional sign. 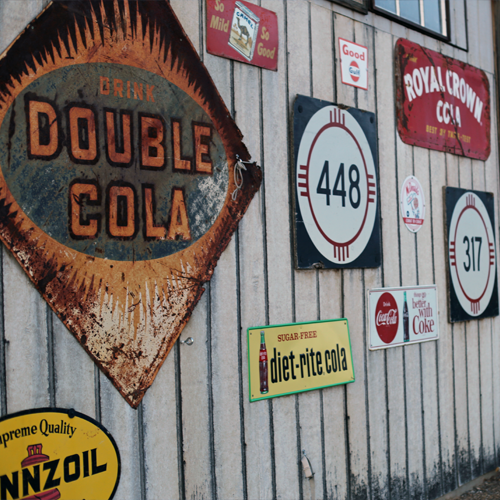 The laundry area and recreation room looked like they were right out of the 1950s, and these signs spruced up the maintenance building in the back. 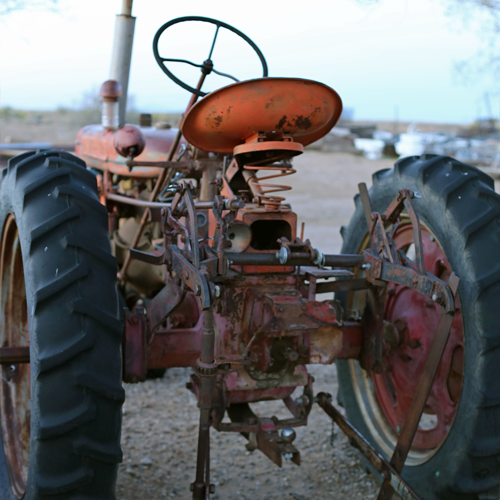 I liked that some of the decor was also functional, like this tractor. 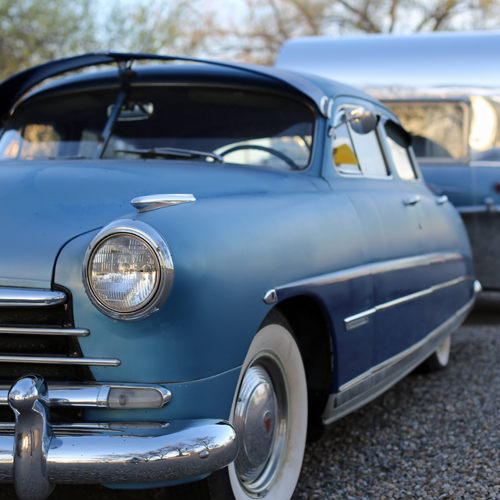 I never knew Airstream made motorhomes until we visited this park — here we saw two of them! 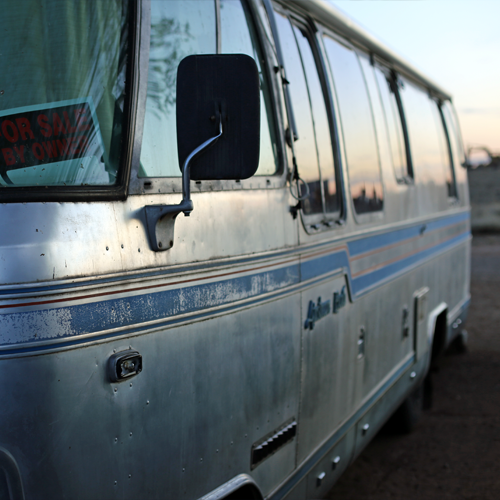 RVs face each other in pairs, so you share a picnic area with your neighbor. We lucked out with a friendly one. 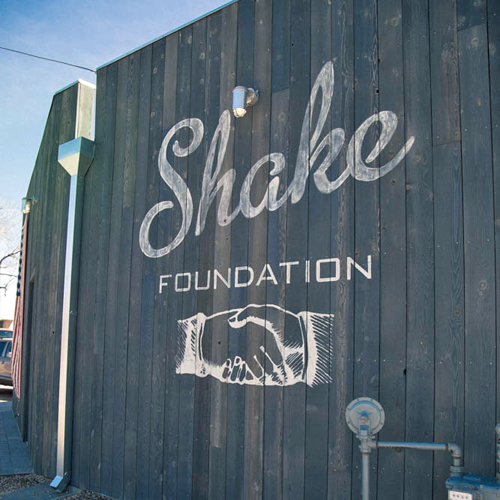 On Saturday, we headed up the scenic Turquoise Trail to Santa Fe, where we started our visit with lunch at the Shake Foundation. 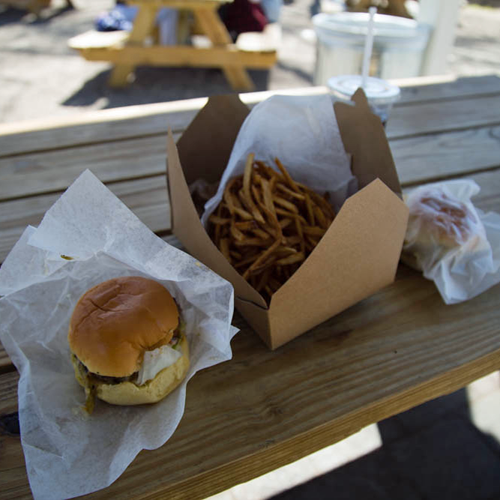 It was a little too chilly for milkshakes, but the hatch chile burgers and fries warmed us right up. And not just any fries. Shoestring fries. Then we headed to Canyon Road, not really knowing what was in store for us. I liked what I found so much, I did a little dance with these guys. 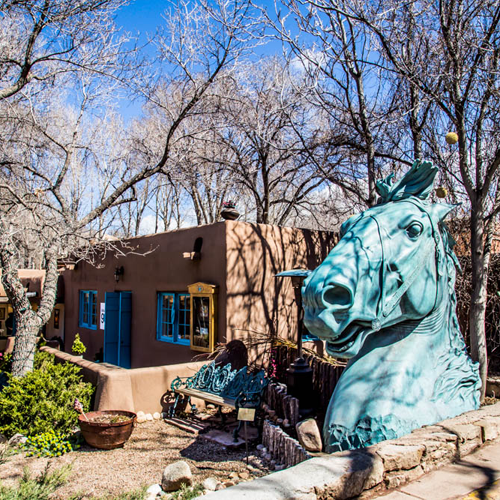 There's something for everyone on this road, which is packed with more than 100 galleries, shops and restaurants all within half a mile. 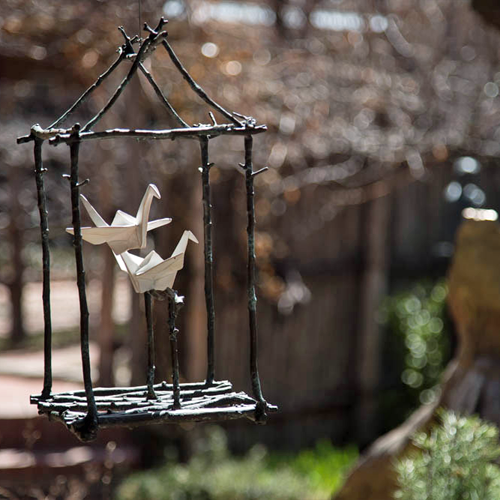 From sculptures to paintings, whatever you're looking for, you can find it here. 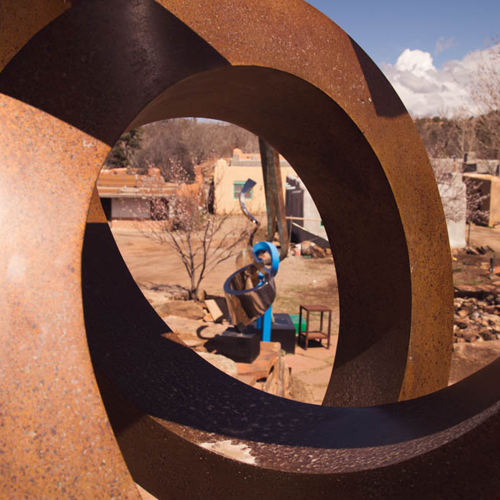 The artwork will bring out your contemplative side. For instance, I was wondering if the leash below was to deter thieves or to keep the pup safe at home. Deep, right? 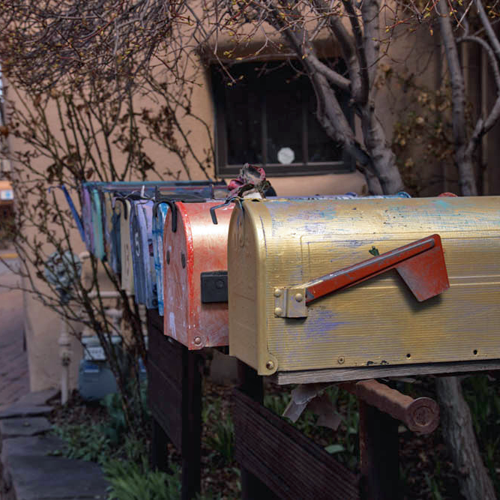 These aren't the only mailboxes that caught my eye. 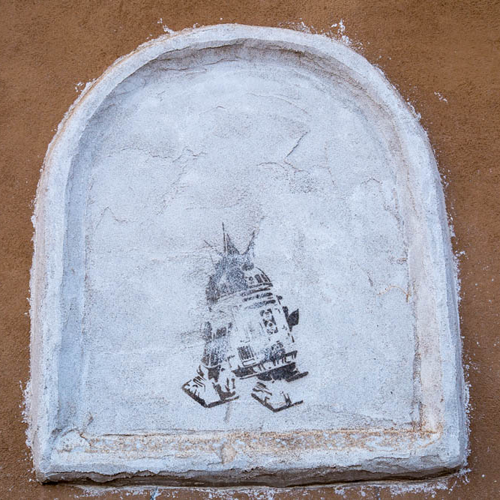 This one is embedded in the stucco. Who needs a pole? 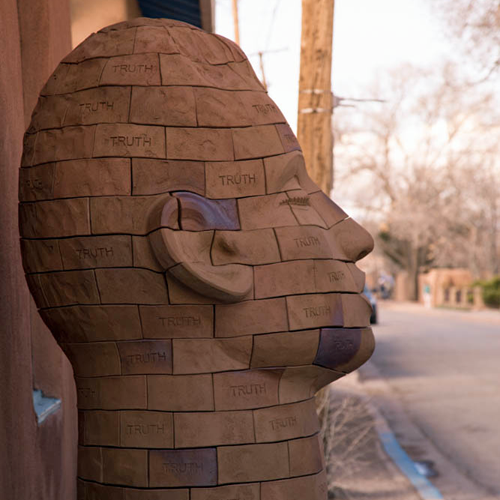 We missed an opportunity to pose kissing this lovely sculpture. 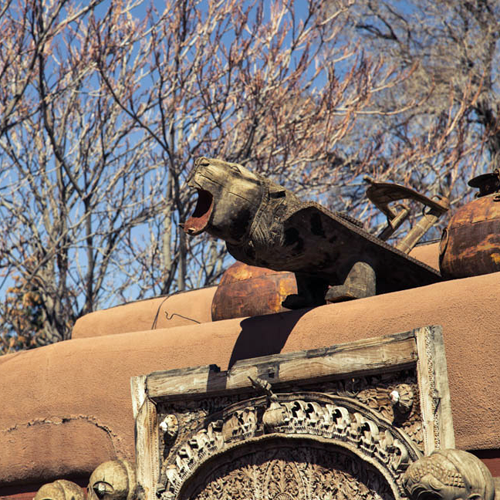 Either way you go, you're bound to find something interesting along Canyon Road. The variety of blues are amazing, from light turquoise to rich navy. 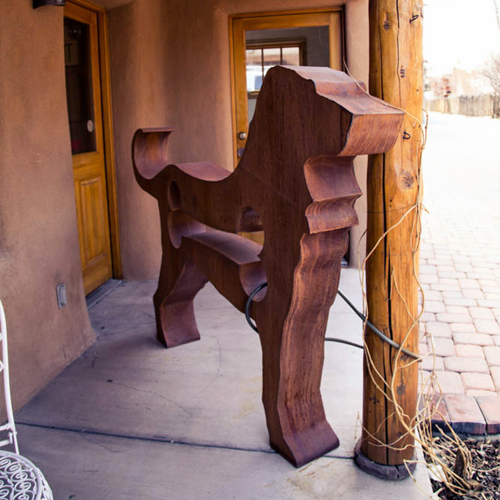 Not all of the art is for sale — or what we were expecting. 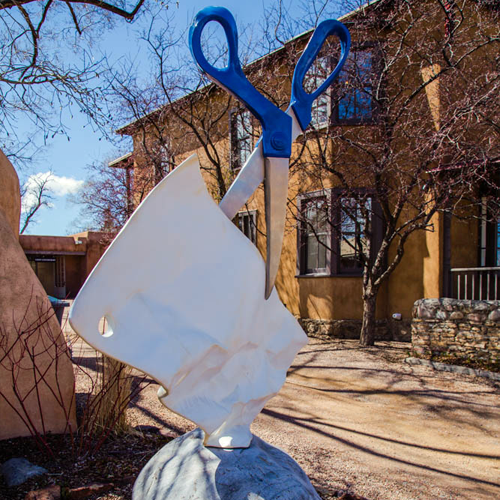 Not only are there galleries along the street, but there are even more in the courtyards below and beside it, providing for hours of exploration. I think scissors must have won this game. This gallery was my favorite. 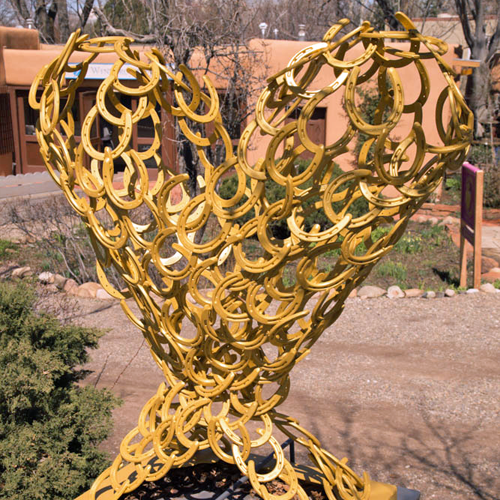 Although we never went inside, we spent a while browsing the sculpture garden behind the building. 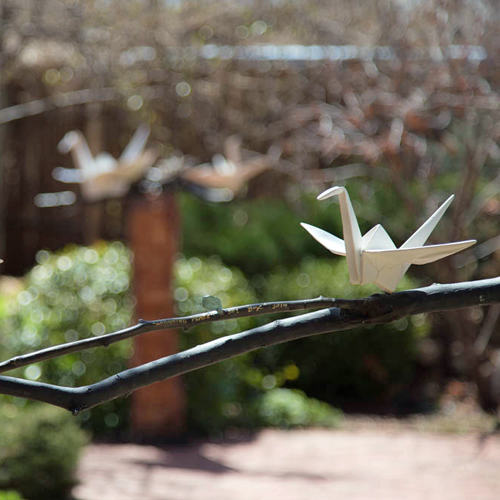 These origami cranes will never be damaged by the elements, as they're meant to be outside. 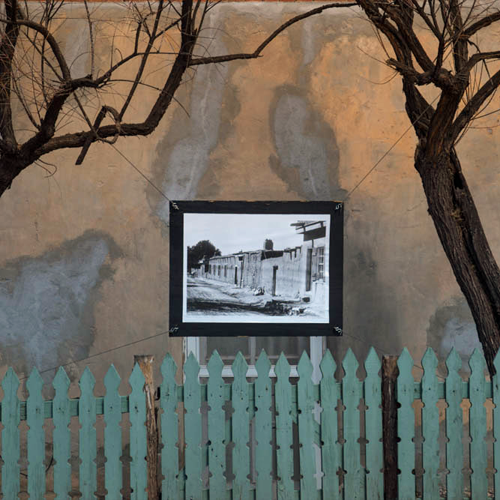 The suspended photograph shows the restored building as it once was, giving a glimpse into the centuries-old history of Canyon Road. Not all of the art is contemporary. 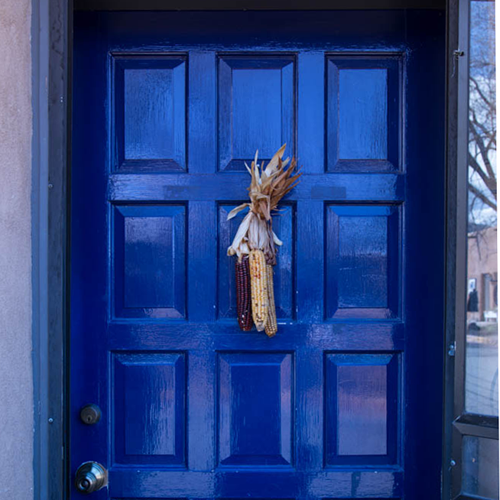 Behind this door are Navajo antiquities, including jewelry, blankets and baskets — all housed in a 275-year-old building. 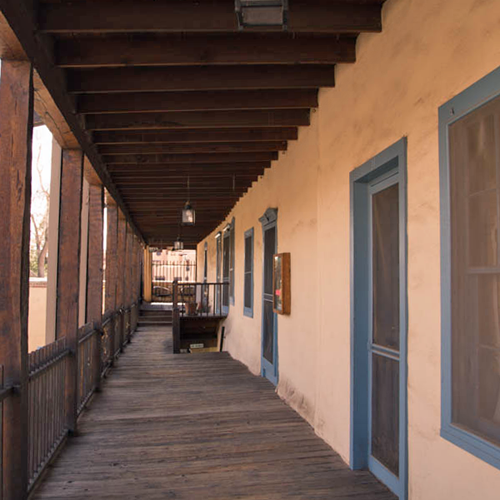 Off the historic Santa Fe Plaza are many courtyards. This one is two stories, so we climbed the stairs to get a view of the restaurants and shops below. 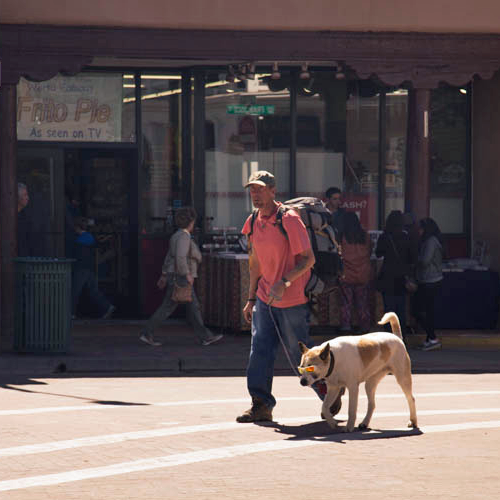 We saw plenty of interesting people in Santa Fe, but none cooler than this awesome pup. 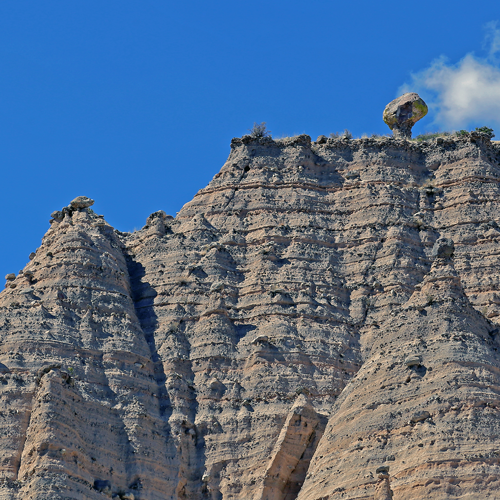 Perhaps the greatest hurrah of our second week in Albuquerque was our trip to Kasha-Katuwe Tent Rocks National Monument. I had never heard of this remarkable place, but it was recommended to me by @CoryStalker, a virtual friend I met on Yonder, a great app for outdoorsy types. 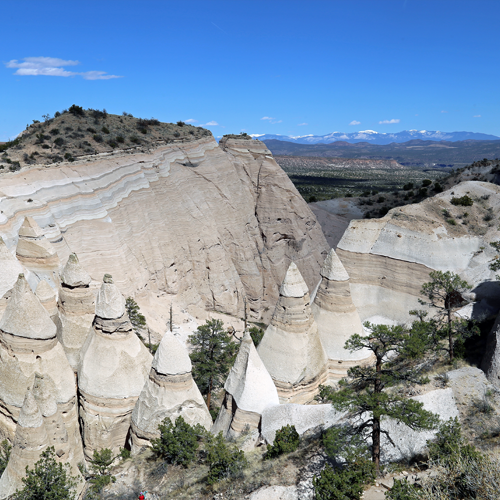 Tent Rocks was only established as a national monument in 2001, but its name is ancient, meaning "white cliffs" in the traditional Keresan language. 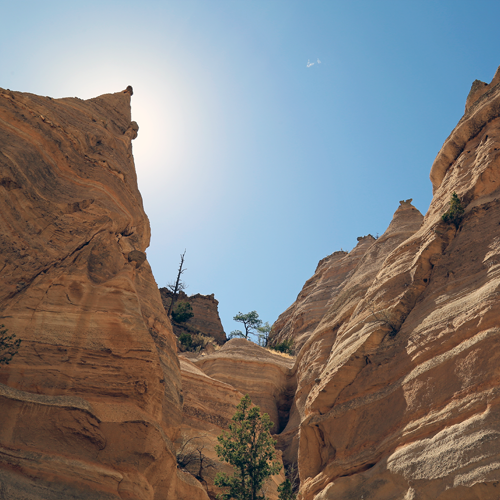 You don't have to travel all the way to Cappadocia, Turkey to see such fascinating formations. 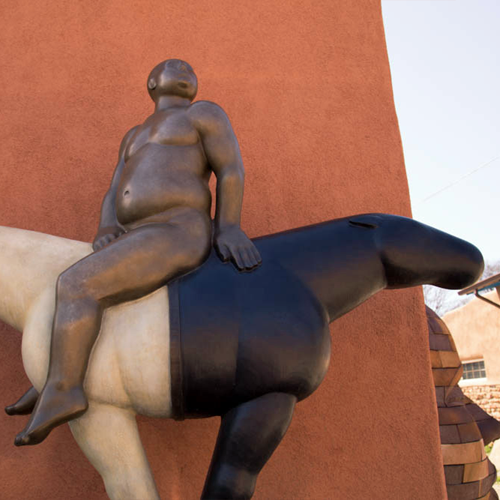 In fact, the national monument is just outside the Cochiti Indian Reservation between Albuquerque and Santa Fe. 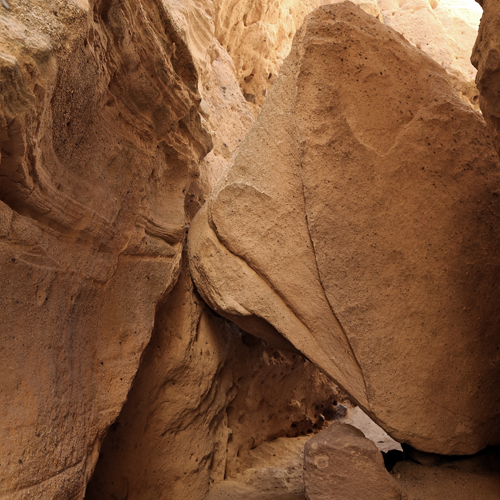 Like Cappadocia, people have occupied this area for a long time — 4,000 years! 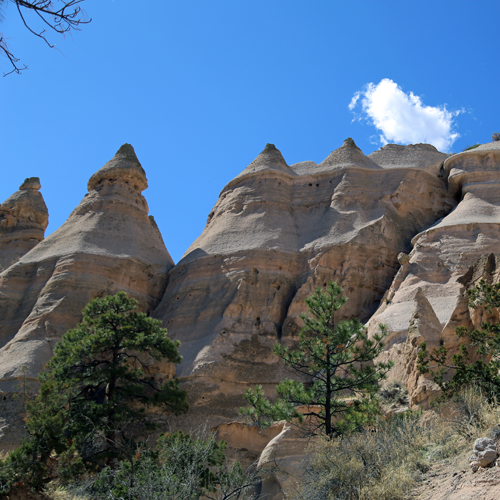 These conical rock formations were caused by volcanoes that erupted more than 6 million years ago. 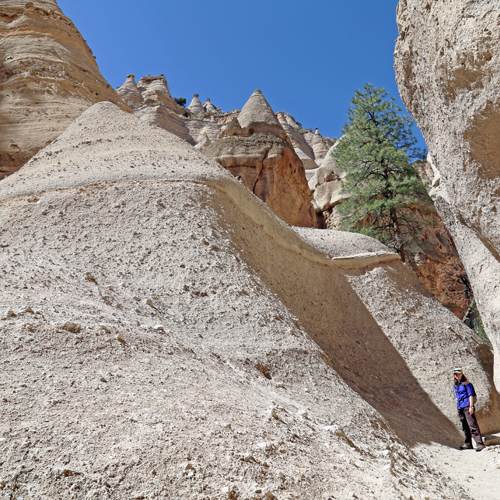 The biggest of the formations are more than 90 feet tall, and they're protected from erosion by boulder caps. 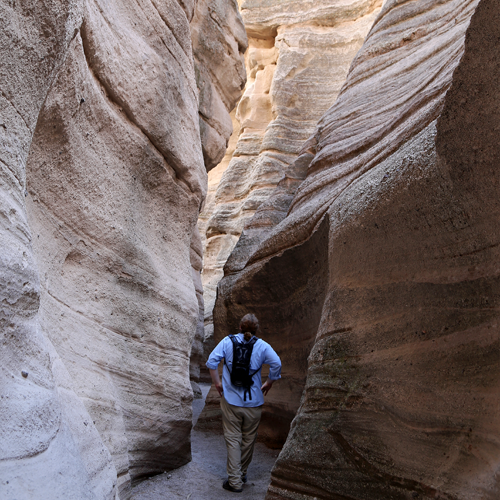 Wind and water created this beautiful slot canyon. Much of the time, it's just wide enough for one person, so hikers have to wait their turn. 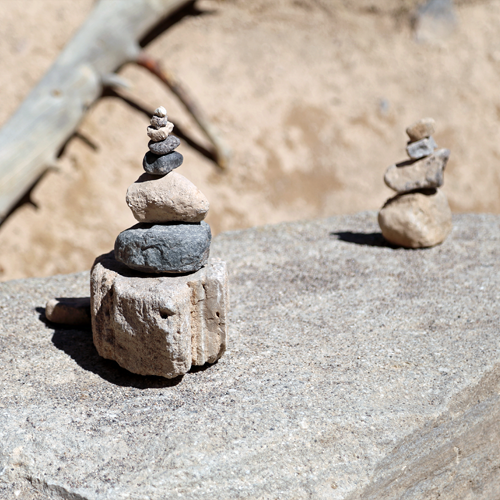 Some boulders have fallen into the canyon over time, making the trail all the more interesting. 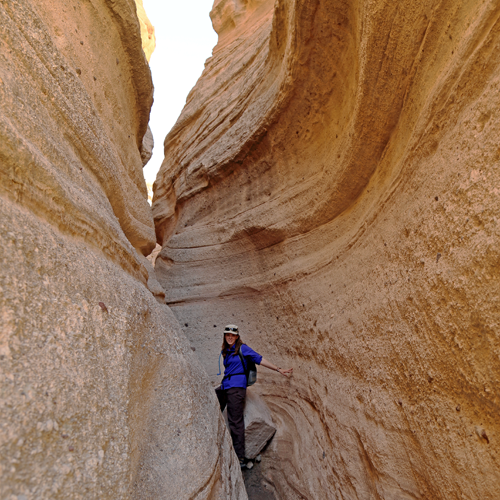 We took the Cave Loop Trail to the Canyon Trail, a 1.5-mile moderate hike that starts off flat and gets pretty vertical near the end, climbing 630 feet very rapidly. 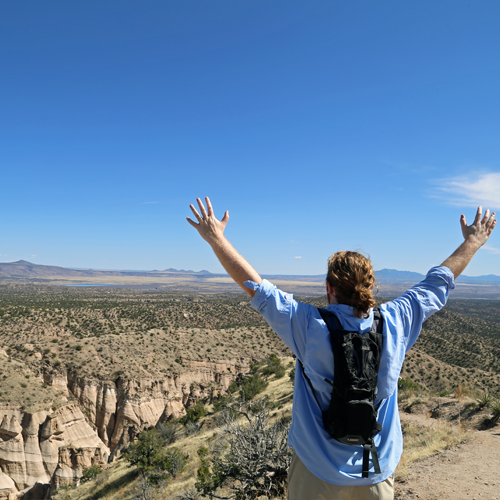 into views like this, where we could see them from above, as well as the desert and mountains beyond. It was a rewarding hike that we won't soon forget. 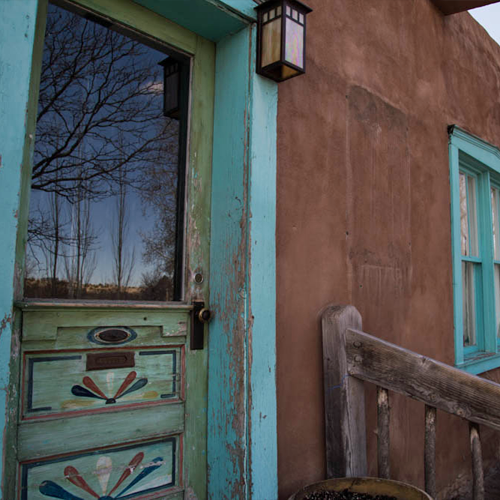 What are your memories of Albuquerque and Santa Fe? 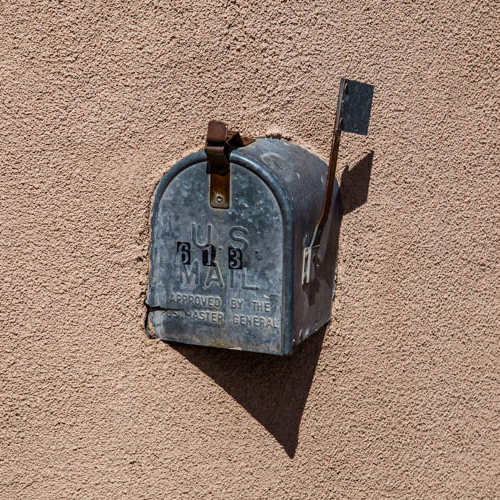 If there's anything special we missed that we must see on our next visit, let us know.